"That which is measured, Improves". Having an entrepreneurial mind set, you would keep improving your blog and websites which more strategies. The best way to keep track of the success is to measure how they are performing and not by just going with your gut-feeling. The same is the case with various Inbound or Outbound links that you might want to keep track of. There are can affiliate banners, eBook download links, a certain advertisement or a webinar call, what ever may that be, you can very easily track them in Google Analytics with the help of 'Event tracking'. Note: There is a quick confusion I need to make clear here is that with Event tracking in Analytics, you don't need to setup anything within Analytics it' self. You don't even need to open it. Simply add the follow link of code for your links that you want to track and Analytics will start tracking traffic for it right away. After 30min to 1 hour, you can visit Google Analytics (more below) and get inspired from the results measured. Now you need to add the event tracking code to the links as shown below. The Anatomy of the Event tracking code is as follows. Category, action, opt_label, opt_value, opt_noninteraction. You only need to take care of the first 3 and leave out the rest. To track the coming via your links, you would only require to set the first 3 tags. Below is an example for a video link on your blog. You can name these tags to what ever you want. They can be totally random and as per your choice, though it's better to choose a logical word so that it would make sense to you once you see the results in Google Analytics later on. I have utilized Event tracking to track the clicks on BloggingeHow's Bluehost affiliate banner and other links on the blog. You can take a look at the code below that I have placed. Now, open up Google Analytics account and click Behavior >> Events >> Top Events to see the results coming from your tracking code. Take a look at the image below. Hope that helped. That's pretty much it to it. Happy tracking links on your blog/website. 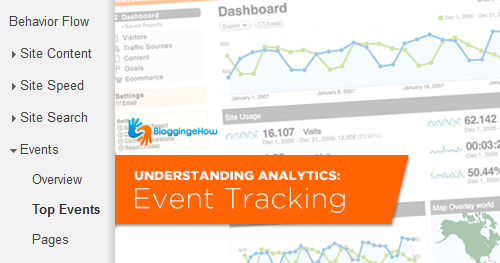 BloggingeHow | Making Blogging Simpler: How to Track Events, Links / Images Traffic in Google Analytics?